Titus 2 [11.] For the grace of God has appeared, bringing salvation to all men, instructing us to the intent that, denying ungodliness and worldly lusts, we would live soberly, righteously, and godly in this present world; looking for the blessed hope and appearing of the glory of our great God and Savior, Jesus Christ; who gave himself for us, that he might redeem us from all iniquity, and purify for himself a people for his own possession, zealous for good works. Titus 2 [15.] 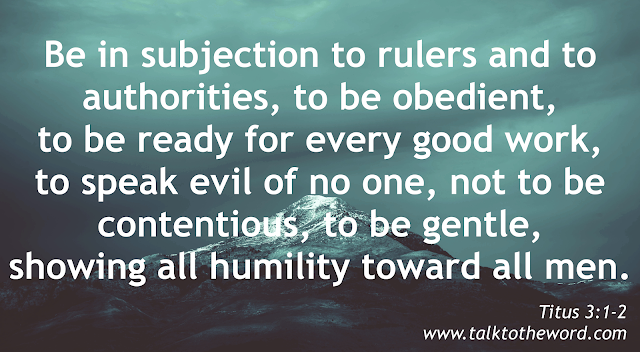 Say these things and exhort and reprove with all authority. Let no man despise you. Titus 3 [1.] Remind them to be in subjection to rulers and to authorities, to be obedient, to be ready for every good work, to speak evil of no one, not to be contentious, to be gentle, showing all humility toward all men. For we were also once foolish, disobedient, deceived, serving various lusts and pleasures, living in malice and envy, hateful, and hating one another. Titus 3 [4.] But when the kindness of God our Savior and his love toward mankind appeared, not by works of righteousness, which we did ourselves, but according to his mercy, he saved us, through the washing of regeneration and renewing by the Holy Spirit, whom he poured out on us richly, through Jesus Christ our Savior; that, being justified by his grace, we might be made heirs according to the hope of eternal life. This saying is faithful, and concerning these things I desire that you affirm confidently, so that those who have believed God may be careful to maintain good works. These things are good and profitable to men; but shun foolish questionings, genealogies, strife, and disputes about the law; for they are unprofitable and vain.